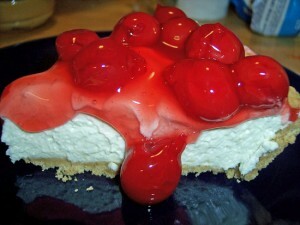 Cherry Cheesecake recipe by R at DesiRecipes.com. Crush all graham crackers and put melted butter. Then put them in a normal size cake pan. For topping mix creamcheese, sugar and whipped cream all together. When it gets thick and fluffy put it on the grahm cracker cake base. Put it in the fridge and let it cool down for 10 to 15 min (or put in freezer for 10 min). Then put cherry topping on and put it back in fridge for 20 to 30 min and serve it.